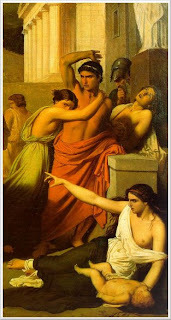 A new article out in the January 2012 edition of the CDC's Emerging Infectious Diseases is called "The Plague of Thebes, a Historical Epidemic, in Sophocles' Oedipus Rex" (Kousoulis et al. 2012). The authors' goal was to try to tease out whether the plague described in the play was an actual historical event, whether it was the same kind of plague known in historical records as the 5th century Plague of Athens, and which pathogen was the cause of this plague. Following a close reading of the ancient text, the authors conclude that the most likely causative agent was Brucella abortus, which causes brucellosis, a zoonosis that is easily passed to humans. It has low mortality rates - as evidenced by the fact that brucellosis can show up on the skeleton - so the authors suggest that perhaps this strain of Brucella was more virulent than previously known, or perhaps the plague referenced was actually multiple diseases affecting the Thebans in Oedipus Rex (and the Athenians in history) at once (leptospirosis, listeriosis, and salmonella, e.g.). The critical reading of Oedipus Rex, its comparison with Thucydides’ history, as well as the systematic review of the existing historical data, lead us to strongly suggest that this epidemic, for which the name Plague of Thebes may be used, was an actual historical fact, likely caused by B. abortus. With the deadly plague, which struck one of the most historic Greek cities, on the one hand and the tragic fate of a character who has become among the most recognizable in world theater on the other, Sophocles masterminded a dramatic frame and offered a lyrical, literary description of a lethal disease. As the protagonist approached his tragic catharsis, the moral order much desired by the ancient Greeks was restored with the end of the epidemic. I'm not big on ancient-historical epidemiology, particularly in cases where there's not likely to be any skeletal data, since it means there's no good way to further an argument based on a close reading of a text. This is one of those cases. Brucellosis can cause bony changes, but it can take years. People who died quickly of brucellosis in a plague situation would not have had time to develop skeletal lesions. The other line of evidence that can back up an historical-epidemiological hypothesis is pathogenic DNA. In 2006, a group of researchers did a DNA analysis of dental pulp from skeletons found in what is thought to be a mass plague grave dating to the 5th century in the Athenian Kerameikos cemetery (Papagrigoriakis et al. 2006). They isolated Salmonella enterica from the skeletons, concluding that the Plague of Athens was likely typhoid fever or a related disease. Some have questioned this research (Shapiro et al. 2006) and the study may need to be redone, but as the recent sequencing of the Y. pestis genome has shown, clearly DNA/skeletal analysis is the way forward in ancient epidemiology. It's unclear to me why Kousoulis et al. don't discuss the DNA study at all. They simply mention "historical medical literature" when citing it. There is an interesting Technical Appendix to the article (which I just found), which does mention typhoid fever. Was the Papagrigoriakis et al. article really so flawed that it shouldn't be engaged with and that typhoid fever shouldn't be considered a possibility for the Plague of Athens? Kousoulis et al. talk about the need for "historical verification" but don't mention the need for scientific verification - there are skeletons, and bioarchaeologists can look for pathogenic DNA in them. Close reading of Sophocles won't give us the answers we're looking for, although it could give us a way to start developing new hypotheses. Update (1/2/11) - Fixed my initial conflation of typhus and typhoid fever. Kousoulis AA, Economopoulos EP, Poulakou-Rebelakou E, Androutsos G, & Tsiodras S (2012). The Plague of Thebes, a Historical Epidemic, in Sophocles' Oedipus Rex. Emerging Infectious Diseases, 18 (1), 153-157. Papagrigorakis MJ, Yapijakis C, Synodinos PN, & Baziotopoulou-Valavani E (2006). DNA examination of ancient dental pulp incriminates typhoid fever as a probable cause of the Plague of Athens. International Journal of Infectious Diseases, 10 (3), 206-214, PMID: 16412683. Shapiro B, Rambaut A, & Gilbert MT (2006). No proof that typhoid caused the Plague of Athens (a reply to Papagrigorakis et al.). International Journal of Infectious Diseases, 10 (4), PMID: 16730469. I find it rather problematic that Kousoulis et al. take some parts of the Oedipus Rex at face value while others are discarded as "poetic exaggeration" like the effect the Thebian plague has on the nature/the harvest (p. 154). You can only do a thing like that if you back it up with other types of evidence like the skeleton/DNA material you mention in your critique. In fact the plague at Thebes could be nothing but a poetic metaphor without any foundation in historical facts. The metaphore of course being based on things known on other dreadful epidemics at the time. This is a very strange article. The authors waffle on whether they are claiming that "the plague at Thebes" was a historical event (which is like asking how fast Fred Flintstone's car could go), or that the plague described in the play was inspired by the historical plague of Athens, which most people already think is probable. And why no mention of Robin Mitchell-Boyask, Plague and the Athenian Imagination: Drama, History, and the Cult of Asclepius. Cambridge/New York: Cambridge University Press, 2008? The very fact that the plague at Athens could have inspired the plague in the play means that we have no need for a historical "plague at Thebes." It doesn't seem to me like you guys have read thoroughly the article you refer to. First of all, the DNA analysis from Kerameikos revealed 'typhoid fever', not 'typhus'. Thyphoid fever is caused by salmonella and is examined by the authors not only in the Appendix, but also in the text when salmonella is referred to as a possible second pathogen. Typhus is a whole different disease than typhoid fever. Second, they would discuss DNA if they had skeletons. It is clear in the article that actual skeletal remains don't exist, therefore a critical comparison of various sources has been adapted. Skeletal examination is the straight way to examine things, but how about retrospective diagnosis? It is usually based on written sources. Recent articles in the International Journal of Paleopathology make that clear and when I compare these with the article on Thebes it seems that the authors have made a quite reasonable retrospective diagnosis. Also, take a closer look at the journal. Manolis J. Papagrigorakis is a reviewer for Emerging Infectious Diseases, therefore, knowing the way these journals work and seeing his work cited in the article by Kousoulis et al., it is absolutely certain that he has reviewed this article. Finally, not only this a multidisciplinary approach, but also the authors are Greek. Greek literature very often shows that drama referred to actual events. A closer reading of the article also points that out. The citations of original sources seems more credible to me than any books written in the 21st century. All in all, I think this is an impressive study, quite convincing given the fact that the authors struggled with ancient sources without the chance of skeletal examinations. Kristina the authors are examining typhoid fever. Thanks for the correction, Anon. I should have read more carefully, as I definitely conflated typhus and typhoid fever. I've corrected the post to reflect this. I'm not clear on your second point, though. The Papagrigoriakis article deals with skeletons, so they do exist. Unless you're referring to the Plague of Thebes which, obviously, there aren't any physical remains. I guess I could be confused about the authors' point. It seemed to me they were linking the Plague of Thebes (fictional) with the Plague of Athens (real) and saying that both plagues were caused by the same thing. While clearly not engaging the skeletal/DNA study, which is the most conclusive evidence for the origin of a plague. I have no doubt that ancient Greek authors used their understanding of disease in their writing. It's entirely reasonable to read about the Plague of Thebes and attempt to figure out if it has enough characteristics to be retro-diagnosed as a real plague. My problem is in the equating of the fictional and real plagues using only ancient literature and modern medical knowledge. So it is definitely an interesting study... inasmuch as retro-diagnosis is an interesting mental exercise. I don't, however, find this kind of close-reading to be superior to biochemical analysis of human remains. It's a good place to start in generating hypotheses about the causative agent of a plague but will never be the definitive answer. I meant that for Thebes there aren't any skeletal remains, therefore authors should be given bcredit for studying so many different sources in order to reach a conclusion. After all, they are talking on evolutionary changes of Brucella, so they are relying entirely on modern knowledge. They are not saying that they were caused by the same thing, in fact they take distances from that opinion. Plague of Thebes was a different epidemic than plague of Athens. I completely agree with you regarding the definitive answer and the superiority of direct examination and I think the authors acknowledge this by using conservative expressions like "suggest", "likely", "probably" etc. I enjoyed the article too. And nice talking to you. This is a fascinating post. I love to think that Oedipus could have been based on something that actually happened. I have used parts of your blog in my own post, with attribution, of course.